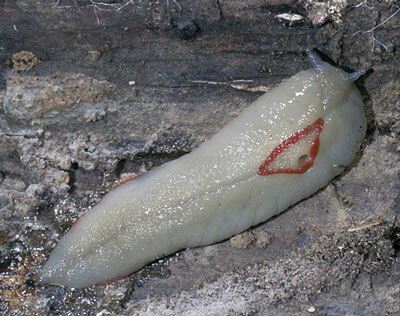 The Red-triangle Slug (Triboniophorus graeffei, length 70mm) is common in the greater Brisbane region of south-eastern Queensland. This species which lives in coastal forests from around Wollongong NSW north to Mossman in northern Qld has many colour forms. The most common colour form is a creamy white animal with a prominent red triangular mantle shield. However, various colour forms exist including all-red and all-yellow animals, both of which occur at Mount Cordeaux near Brisbane. It is likely that future molecular studies may reveal that some of these colour forms are actually distinct species. This lichen-eating slug leaves feeding tracks (lines of small arc-shaped markings) which can often be seen on smooth barked eucalypts.